We went from rainy, cold Paris to hot and sweaty in Barcelona in August. Barcelona is hands down my favourite city in the world. True, I haven't visited many places but it easily tops all the places I've ever been. There's something extra special about the atmosphere in this beautiful seaside city. The place is so warm and welcoming, and the people so friendly and playful. Everything's just so relaxed yet full of life there unlike at home in Oz where it's relaxed 'cause we have a culture of laziness - probably because we are all lethargic from not having siestas and/or in a drunken stupor. We did all the tourist things, visiting the otherworldly architecture of Gaudi, visited a castle by the sea, walked by Olympic Park for the novelty of walking by an Olympic Park - primary school me still remembers those Games, that year was my favourite of Olympics memories, and I remember our cousins got us Barcelona game tracksuits - white with black, teal and yellow streaks. Ah, the memories. I wonder if I have a photo of those somewhere. We visited the Museu Nacional d'Art de Catalunya - for the view, not the art because we overdid the art in Paris and needed a break. The gallery overlooks a massive water fountain feature, but we were there during off-time and didn't have time to come back for the fountain show. Instead, we opted to go to the beach for a swim in the strangely calm ocean. The waves break right on the shore and the rolling waves are really gentle - not like the waves at home in sunny Queensland that try to smush you on a bad day, or push you over on a good day. I could have floated there for hours being rocked by the sea. But I didn't because we got hungry and went for dinner at one of the restaurants on the beach. Oh, take me back! I did a solo trip to the Aquarium by the sea because I am a child trapped in a slow-to-age Asian woman's body, and went for a walk along the beach on my last night in Barcelona. 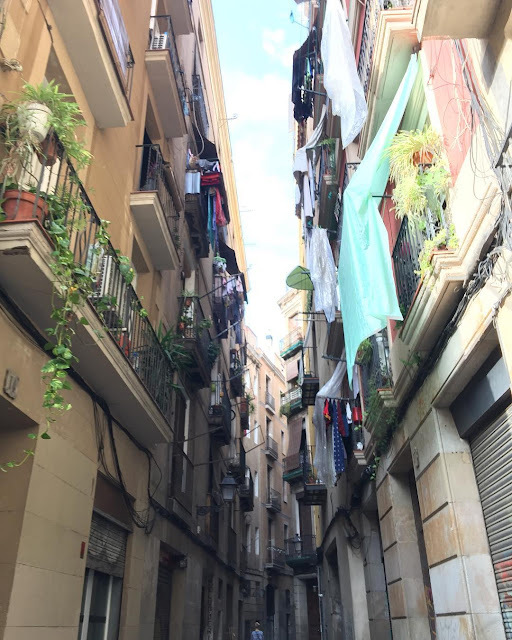 Looking back, our time in Barcelona was the most chill and happy time we had on our trip (apart from our Phamly Reunion). That's what all ideal holidays should feel like - I felt small and humble and appreciative. I hadn't felt that relaxed and happy in years. We left Barcelona the morning of August 17, and the terrorist attack happened that afternoon. I only learned about it because our cousin in Germany messaged me to ask if we were OK. I messaged the Phamly straight away even though it was night time back home, then waited til night in Marseille to call dad in case he heard about it through the news and worried. It's so sad that people think killing randomly is the answer to their problems with the world. The three of us were wandering that street just the day before. It's dumb luck where you are when these attacks happen. On this leg of the trip, we were on our way to Nice where the truck ran people over a year ago. It makes me sick to think people out there have so much hate and anguish in their heart, they think the solution is to kill people randomly.